Aten, or Aton, was an ancient Egyptian god who was worshiped during the reign of the pharaoh Akhenaten (1350s to 1330s B . C .). Unlike earlier pharaohs, who had worshiped many gods, Akhenaten claimed that Aten was the one supreme god. This may have been the earliest example of monotheism in the ancient Near East. 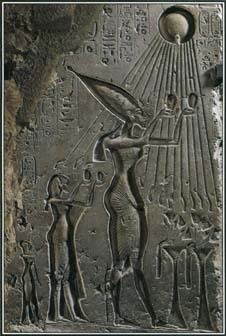 Aten was depicted as a disk, representing the sun. Rays of light ending in hands extended from the disk and reached down to the king, his family, and the natural world. Originally named Amenhotep, Akhenaten changed his name to mean "right hand of Aten." Akhenaten was determined to promote Aten as the only supreme god and not to honor other gods. To this end, he tried to get rid of images of other gods and to reduce the power of the priests who led the worship of other gods. He built temples to Aten and established a new capital city, called Akhetaten, or Horizon of Aten. Today that city is known as Amarna. Much of what is known about the worship of Aten comes from the Hymn to Aten , a joyful poem inscribed on the walls of some ancient tombs at Amarna. The hymn describes Aten as the only supreme being and the creator of all life. It says that Akhenaten and his wife, Queen Nefertiti, are the only people who can understand the god and express his wishes. The hymn speaks of Aten as a loving god who brings order and beauty to the world. This stone relief shows the pharaoh Akhenaten and his family worshiping Aten. According to the Hymn to Aten, Akhenaten and his wife, Nefertiti, were the only people who fully understood the god and his wishes. The worship of Aten as the sole supreme being lasted only for the years of Akhenaten's reign. The Egyptian people could not accept the idea of one supreme god and returned to their old belief in many gods. They destroyed the temples to Aten, and he became a minor god among all the other gods. * See Names and Places at the end of this volume for further information. See also Amun ; Egyptian Mythology .